Do you need to take English Courses this Summer session or Fall semester? Then this guide is for you! See the General Education English Sequences to know which courses you can take to fulfill your institutional requirements for English. Basic English (3101-3102) leads to Reading and Composition (3201-3202/3209/3289) NOT to Intermediate English. Intermediate English (3103-3104) leads to electives in English (listed in the link above) NOT to Advanced English. Advanced English (3211-3212) fulfills your institutional English requirements, but are NOT equivalent to electives in English. Please be clear about what sequence you’re in and satisfy those requirements to avoid graduation delays later. You can take a look at the Fall schedule here, keeping in mind that the document is color coded for English Department Students. Here is the Summer schedule. Here’s the Fall 2018 schedule, color coded for your convenience. For course promos on some of the courses, check the courses category in our blog. Curriculum for bachelors in English (including teacher preparation program) – This document lists all the courses you need to graduate. Did you schedule a meeting with your advisor? Professional and Recommended Electives – Professional electives are the unspecified English courses you need to take in the Literature and Linguistics track in the Curriculum. Consult the Course Offering Master Schedule to know when courses are offered and which courses you need to take. 6000 Level Course Authorization Form – We encourage advanced undergraduate students to enroll in graduate courses. 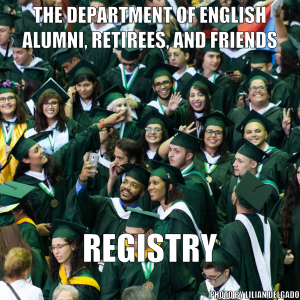 We recommend having completed 27 credits in English and have a 3.5 GPA in their English major, prior to enrollment. This can be waived by the professor teaching the course, if they feel the student is qualified. If you wish to take a graduate course, contact the professor offering it and request authorization to enroll in the course. Bring that form to the English Department so we can enroll you in the course. There are some new and established research and internship course opportunities (some paid!) within the English Department that you might want to consider. Consult the Graduate Course Requirements and discuss them with your advisor to decide which courses to enroll in and when. The Course Offering Master Schedule to know when courses are offered and which courses you need to take. For course promos on some of the courses, check out the courses category in our blog. If you’re planning to do an Independent Research (INGL 6995), please remember to have the professor submit a brief syllabus that describes the research activities and how you will be evaluated.